Former postgraduate students, Andrios de Souza and Mauro Nardelli entered a project on epoxy- and carbon-based composite inserts for automotive applications. Three Brazilian projects have been approved to participate in the Startup Booster, a competition created by JEC Group for academic spin-offs and startups involved in composites. The reported aim of the initiative is to promote the development of innovative solutions using composite materials. Almaco, a partner of JEC Group in Brazil, chose the projects entered in the competition. ‘Two of the three ideas came up during the postgraduate courses in composite materials that we have been promoting since 2011,’ said Erika Bernardino, manager of Almaco. 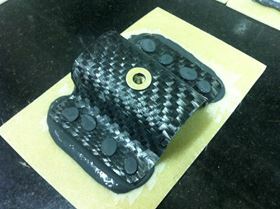 Former postgraduate students, Andrios de Souza and Mauro Nardelli entered a project on epoxy- and carbon-based composite inserts for automotive applications, while Augusto Biscaia, Fernando Melo, Gil Tamalu and Wellington Nogueira submitted to the JEC committee a new process for molding parts with removable cores. Guilherme Siebel, a mechanical engineering student, entered the competition proposing the production of carbon-fiber bike wheels, frames and saddles. Open to applicants worldwide, the Startup Booster is divided in two categories: ‘Processes,’ which judges design and manufacturing technology solutions, and ‘Materials & Products,’ geared towards the development of new materials and applications. The ten companies chosen by the JEC Group jury will pitch their projects to potential investors at the JEC World 2018 fair, in Paris. The three winning companies will receive a €10,000€ prize. Kordsa has outlined its participation in JEC World 2018, the biggest composite technology show of the world.